I know, I know.. I’m LATE. and I owe you ths spill on the outcome of the Chelsea Music Festival, the happening at El Chevere, and the crunch on cracker candy. But I also know that yesterday was the 4th of July- just another American excuse for getting together for grilling and grubbing. (Technical difficulties hindered my posts for the past two days, So if you would, please just pretend this post is on time.) In recognition of that realization that Independence Day is only a few hours away (or past at this point), this post is short and sweet as to remain relevant. Burgers and the works: The juicy, red, meaty mass hits the flaming hot grill. This patty, on its way to becoming a burger sizzles with excitement as its contained molecules applaud their release. The juices climb through the air, forming a hazy white mist that fills the air and clouds your nostrils. Beautiful, meaty goodness begins to ooze from beneath the burger and bubbles around it. Give it a few minutes, and the exterior begins to caramelize, turning from a bloody red to a rich, savory brown, with shadows of a smoky char. If you’re not already drooling, picture that square of cheese, as it begins to seamlessly embrace the burger with an almost romantic intimacy. Now, frame that love scene on a warm, toasty yet soft bun. We can stand back and adore the masterpiece but how do we arrive there? The history of the hamburger remains within the mystery of a game of tug of war. With such an American love, many people have fought for the credit. The hamburger has doubtlessly endured plenty refinement, beginning somewhere, I’m sure, within the Middle Ages. What we know as the American hamburger has been said to originate at the Seymour Fair in Wisconsin, 1885, by Charlie Nagreen, who sought to increase the portability of his meatballs. Another story contends that that same year, the Menches brothers substituted beef when they ran out of pork for their sausage patty sandwiches. One of the most popular and believed claims spits out a tale that the burger was invented by Louis Lassen at his lunch counter, Louis’ Lunch in New Haven, CT, 1900. Louis broiled his burgers in a vertical cast iron stove, suspending the burger between wire racks, and one day, for a rushing customer, sandwiched the patty between two slices of toast. It wasn’t until about the early 1900’s that burgers made themselves at home within the shelter of the bun. …But who cares?! I mean, I’m sure it’s of some worth and intrigue, but at this point I’m hungry, and as far as I’m concerned, the most important creator of the burger, is the most recent, the one who has committed to conveying a hunk of ground meat to the caramelized patty on my plate- whoever’s making dinner tonight. The history is only interesting up to the point that it obstructs the present- depriving us eager diners of wrapping our mouths around the wonderful gift of food. I’ve seen many varieties of burgers. There are plenty I have not seen, some I care not to see, and some I’d love to see again. I ask the forgiveness of my burger purists, but one of the most counterintuitive yet sensible combinations is what has been termed the Luther, which uses toasted glazed doughnut halves in place of the buns. (The way the story goes is that Luther Vandross was backstage at a concert of his and wanted a burger. However the caterer had ran out of buns. Neglecting to wait, he requested a glazed doughnut they had on hand and the sandwich was born.) 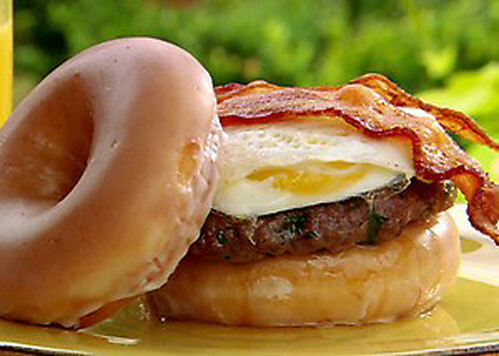 Some variations include bacon, American cheese, and a fried egg. It is by no means the healthiest but it triumphs that salty-sweet craving and its meatiness is draped in the creaminess of the egg. I don’t usually do much more to burgers than salt and pepper, high heat, toasted bun, lettuce, tomato, and pickle- mayo and ketchup or barbecue sauce. (I find satisfaction in a half pound patty.) Most recently, when I think of burgers, I think of caramelized onions and any sort of cheese: Cheddar, American, Gouda, Blue, Provolone. Black pepper crusted– Salt and course ground black peppercorns. The thickness of the seasoning helps to form a flavorful crust. Grilled pineapple– Caramelized onions on the bottom, burger, grilled pineapple, bacon, barbecue sauce. At this particular moment, my brain is fried. But I’ve said lots about burgers at the Vortex in my “Buns and Booze” article. Take a bite! Burgers taste lots better than my fried brain.